Sapa is an ideal tourist place for trekking tours. On this trek you will not only explore the beautiful Sapa valley but also find the different cultures of different ethnic people for three days tour with two nights home stay in Ta Van Ban and Ho village, home of the Dzay and Tay minority. 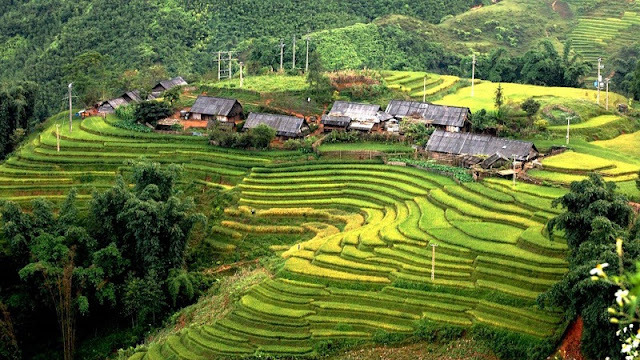 The trekking adventure gives you the bests of Sapa in an exotic way. Instead of taking popular trek routs, this special trek starts in Y Linh Ho village and finishes in Ban Ho village before backing to Sapa. The name of Ban Ho village : may be due to Ban Ho includes many rivulets streams and the central village is close to waterfall roaring for all years , ancient call Ban Ho , Ban Nuoc. Ban Ho is far from Sapa town about 20 kilometers. It is divided into three areas: Ta Trung Ho, Xeo Trung Ho and Hoang Lien, which is place of the Mong, Dao, Tay. Come to Ban Ho, you will be alive and living in the cozy ambiance and friendly family. Because the climate in Ban Ho is warmer than Sapa (between 18-250C), in the afternoon, tourists can enjoy yourself in the stream Lave, sight Da Nhay waterfall. Ban Ho Village, Ban Ho is worth the somewhat difficult trekking journey to get there, as the village rewards visitors with stunning views of unspoiled sites and an opportunity to discover the daily activities of the ethnic people Tay. On the way to the waterfalls, which were named by locals after seeing fish jumping out of the water in the old days, visitors will pass brooks gently running down bamboo cylinders that locals use to channel the water into their terraced paddy fields, wooden houses perched on the sides of rolling hills and wild flowers.